Also just a heads up this a pretty picture and text heavy post so bear with me.... I have a lot to say/show! Haha! The recipe makes about 6-9 bowls, depending on how much soup is in each. It's pretty thick/creamy so if you need to stretch it, add more chicken broth to thin it out. It will still taste just as delicious, I promise! You can also use spinach instead of kale if you choose too. 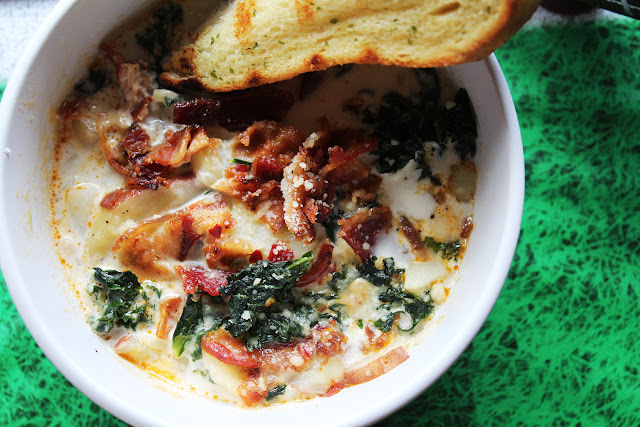 Serve with garlic bread and a salad for the perfect Souper Bowl (wink, wink) dinner! Seriously how delicious does this look?! It's sure to please all your guests and keep them full throughout the game! So let's get to the recipe! 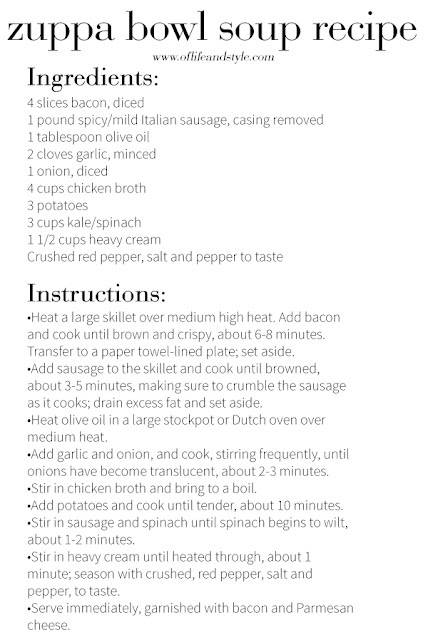 For this recipe you're going to need bacon, spicy sausage (can use mild if not a huge spicy fan), olive oil, garlic, onions, chicken broth, potatoes, kale (or spinach), heavy whipping cream, red pepper flakes, salt and pepper. I will have the exact measurements listed below! 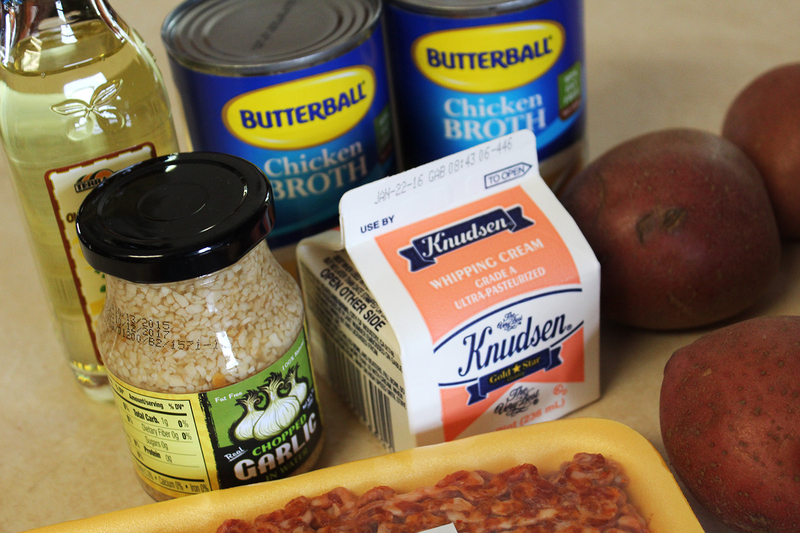 Depending on what ingredients you have on hand already (oil, onion, garlic, broth, potatoes, etc.) this recipe can be anywhere from $10 to $20. 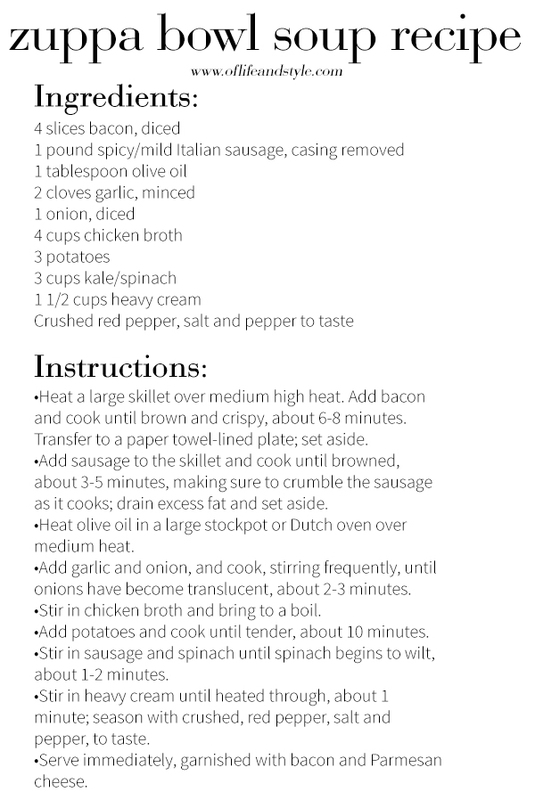 Whenever I make this I usually have to pick up the sausage, broth, kale and whipping cream which typically will run me around $13ish dollars. It will feed my family a bowl or two each and still have leftovers. You definitely get your bang for your buck! First, cook a few slices of bacon in a large skillet over medium high heat. This will be used as garnish for later on. Once the bacon has cooked, transfer to paper towel lined plate and drain any excess grease. 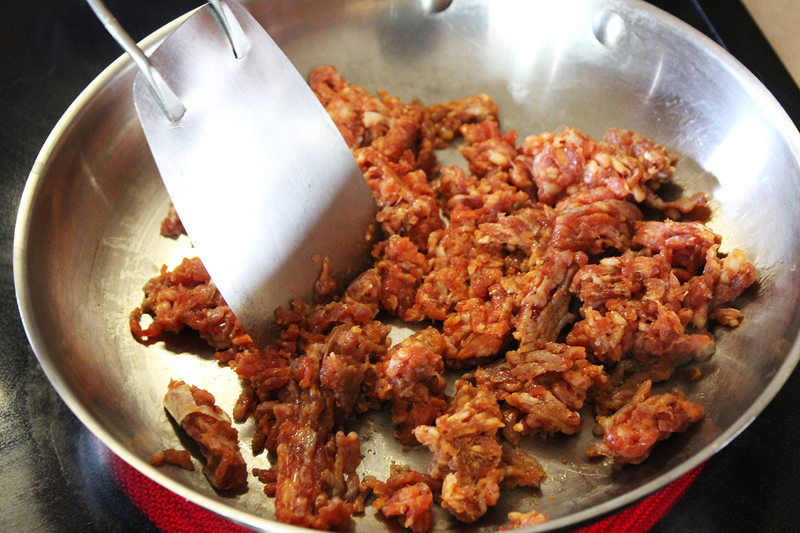 Now add your sausage over medium high heat, crumbling as it cooks, until completely cooked and browned. Drain excess fat and set aside for later step. 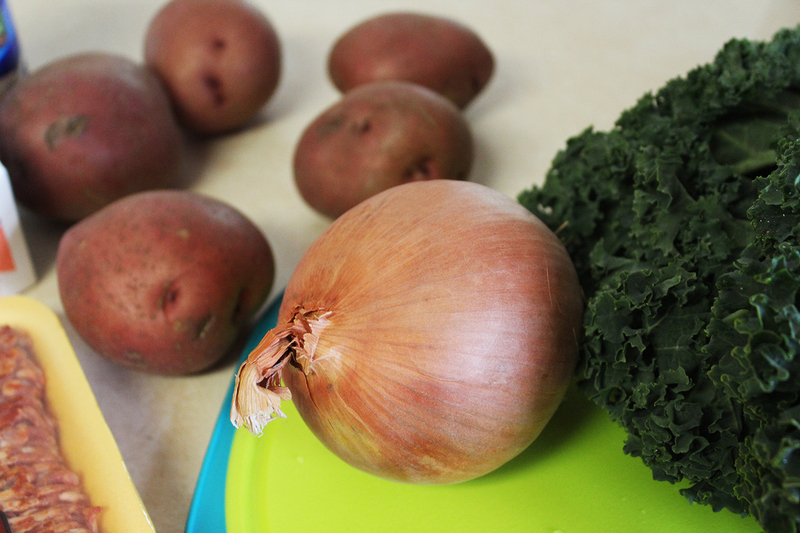 Rinse or peel your potatoes (I used red for this batch but you can use any kind) and start cutting them. I like slices but you can cube them if you prefer. It's totally up to you, there's not a wrong way to cut the potato. Haha! Set them aside in a bowl for the later step. Now in a large stock pot or Dutch Oven add olive oil (or any type of oil) to the pot and heat on medium to medium high heat. 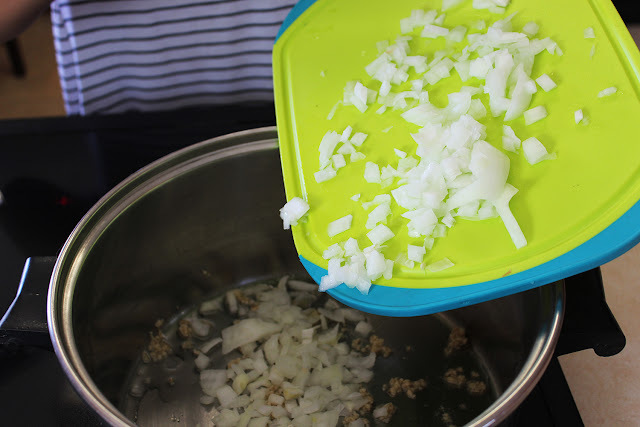 Once heated add onions and garlic and cook until onions are translucent, just a couple of minutes. Then add chicken broth, stirring to combine. Now bring onion, garlic and broth mixture to a boil. Once to a boil, add potatoes and cook until potatoes are tender, about 10-12 minutes. You can check to see if they are done by touching the pieces with a fork. If it goes in easy or mashes they are done, if it has resistance then they need to be cooked longer. 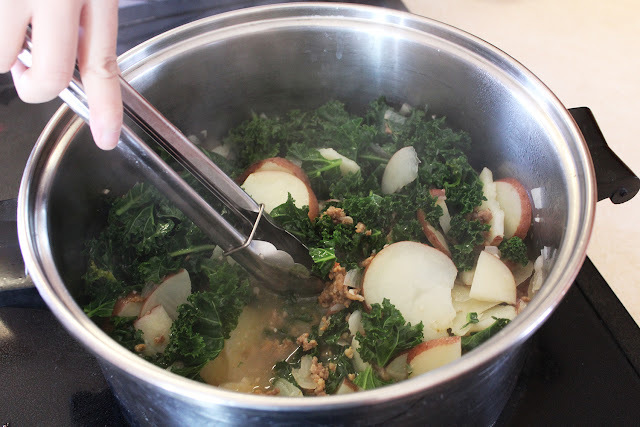 During the potato cooking, rinse, de-stem and roughly chop your kale.The recipe calls for 3 cups but I usually just use one bunch of it. You can add more or less depending on if you like it or not. You don't need to make sure every piece is the same size but make sure it's small enough to scoop with a spoon. Now it's time to add the sausage and kale. Stir to combine and until kale starts to wilt. You can also cover it for a couple of minutes to speed the wilting process. 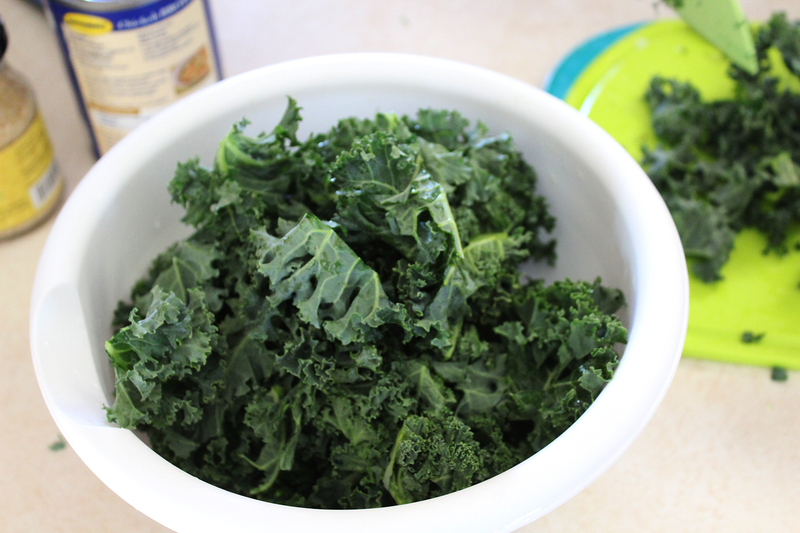 Once kale is wilted, stir in the heavy cream until the soup is heated through. Flavor with salt and pepper to taste and crushed red pepper flakes for an extra spicy kick. Take the bacon from earlier and chop into crumbles to add to the soup for garnish. Sprinkle Parmesan for garnish as well and serve with garlic bread! And voila! Your soup is done! 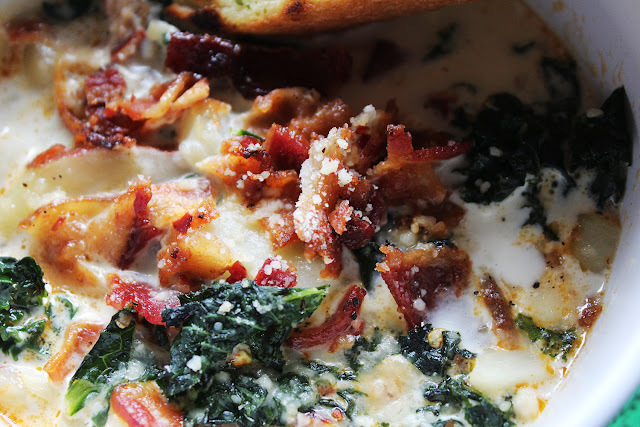 It's creamy, spicy and crunchy, hearty and just generally super delicious! 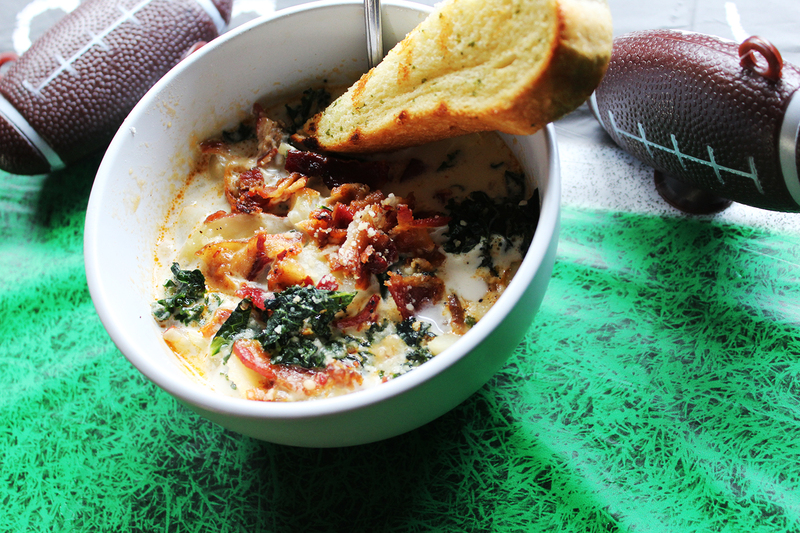 A bowl or two will definitely fill you up and throw in some garlic bread and salad and it's a full meal! All in all it takes just a little over an hour to make, start to finish, which is not too shabby for a homemade from scratch soup. The first time I made it I was sooo impressed with how easy it was to make, how quickly it took and how amazing it tasted. This is soup will be a big W-I-N in your book! 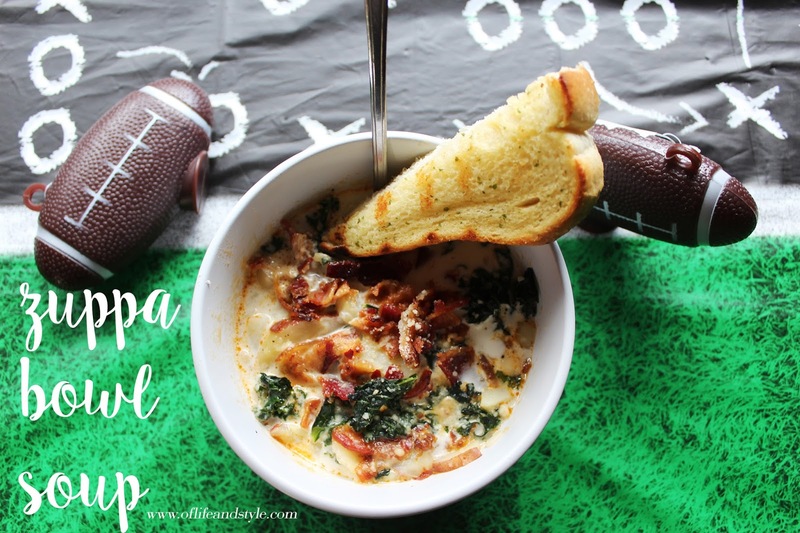 If you recreate this soup I would LOVE to see the finished product and your thoughts on it! Send and tag me in the photo or strike up a convo using the #SouperBowl hashtag on Instagram or Twitter (@samantha_goble) for both! I hope you guys enjoyed this soup recipe. It was a new experience for me shooting a cooking type post but I had a lot of fun doing it. If you guys liked this type of post let me know and maybe I'll start doing more cooking ones! What are your Super Bowl plans? Who are you rooting for? Excited for Beyonce to perform? Leave me a comment sharing!